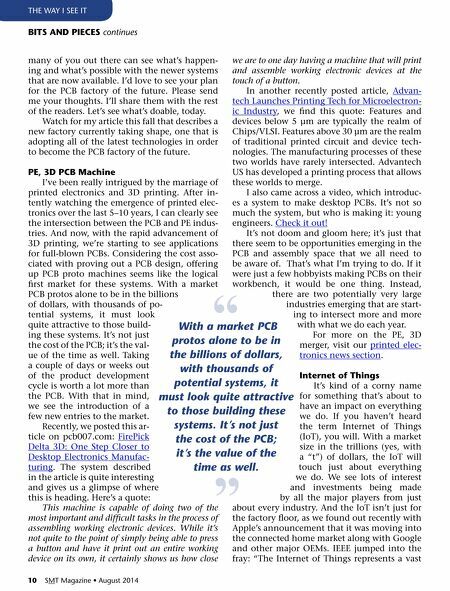 August 2014 • SMT Magazine 11 THe wAy i See iT Ray Rasmussen is the publisher and chief editor for i-Connect007 Publications. He has worked in the industry since 1978 and is the former publisher and chief editor of CircuiTree Magazine. To read past columns, or to contact Rasmussen, click here. BIts aND PIECEs continues landscape of amazing potential; we are just now beginning to grasp how truly far the growing convergence of many traditionally standalone applications and cyber-physical systems can take us," said Oleg Logvinov, IEEE committee chair who is director, special assign- ments, Industrial and Power Con- version Division, STMicroelec- tronics. To read more about IEEE's efforts, click here. I wouldn't say I'm mes- merized by all these new and emerging technologies and industries, but I am certainly intrigued. I am quite hopeful that our industries will em- brace some of the newer man- ufacturing technologies as well as the emerging ones and incorporate them into their of- ferings as soon as is applicable. I hope the industry will not be blindsided by what's coming, but will instead seize the oppor- tunities they offer. That's why we cover this the way we do. It's impor- tant. Pay attention. sustainability in the supply Chain Pam Gordon, of Technology Forecasters, has written an article for Green Biz titled How to make electronic trade groups drive sustainabil- ity. With help from IPC, Gordon gathered input from association members to gain some per- spective on how industry associations engage their members on environmental sustainability. A couple of questions: First, is it their (the asso- ciation's) job to drive this in the industry? Sec- ond, what is "environmental sustainability"? Here's how the U.S. Environmental Protection Agency describes it: Sustainability is based on a simple principle: Everything that we need for our survival and well-being depends, either directly or indirectly, on our natural environment. Sustain- ability creates and maintains the conditions under which humans and nature can exist in productive harmony, that permit fulfilling the social, econom- ic and other requirements of present and future generations. Although I think it makes for an interesting article and it caught my attention, I'm not so sure this is an issue for our associations. Where are we falling short? Yes, we all use dangerous chemicals, but what does that have to do with sustainability? If we're doing our environmental bit, what are we doing that isn't sustainable? If we're keeping the air and wa- ter clean and recycling every- thing that can be recycled, why do we need to make this an industry issue? Can we all do our part to lessen our im- pact on the environment? Sure. But it's the OEMs and the politicians that will drive the effort toward cleaner tech, not the associations. Sustainability is important to making sure that we contin- ue to have, the water, materi- als, and resources required to protect human health and our environment. And, if you have a flat roof, which most of our factories do, you should be looking into solar options which will lessen your im- pact by helping to clean the air and reduce the impact of global warming. I suspect that most, if not all, chemical companies have their own sustainability efforts underway, along with all the component makers. 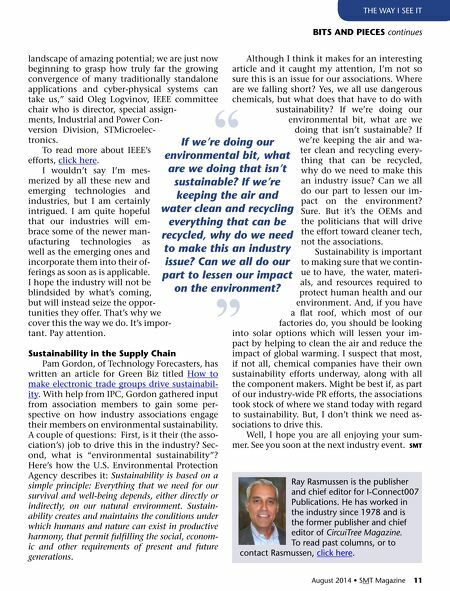 Might be best if, as part of our industry-wide PR efforts, the associations took stock of where we stand today with regard to sustainability. But, I d on't think we need as- sociations to drive this. Well, I hope you are all enjoying your sum- mer. See you soon at the next industry event. sMt If we're doing our environmental bit, what are we doing that isn't sustainable? If we're keeping the air and water clean and recycling everything that can be recycled, why do we need to make this an industry issue? Can we all do our part to lessen our impact on the environment? " "